While it may seem as if we just got through a major Intel processor refresh (because we did), the latest rumors out of WccfTech suggest that Intel’s 9000 series of Core processors isn’t far off. The outlet claims to have come across marketing materials and product names for a number of upcoming Intel processors, namely the Core i9 line of CPUs, which will join the mainstream lineup on Intel’s upcoming Z390 chipset for general-use and gaming PCs. You’ll immediately notice three things about this supposedly leaked lineup: first, that there is no Core i3 option listed. As the outlet points out, this could either be Intel phasing out the product from its Core line of processors, or that it will release at a later date than these chips. The second thing you may notice is that the Core i5 option has no hyperthreading. Finally, there is no quad-core part listed here, for the first time in an Intel processor lineup. That is, unless a 4-core Intel Core i3 part is waiting in the wings. 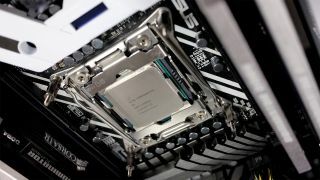 WccfTech’s findings continue to claim that the Z390 chipset is not that far advanced beyond the existing Z370 chipset that launched late last year to support the first Coffee Lake desktop processors. However, they will bring features introduced to the latest H-series entry-level platform earlier this year. Those features include Intel 802.11ac Wi-Fi, Bluetooth 5.0, a native Intel Wi-Fi adapter and support for up to six USB 3.1 (Gen 2) ports. Currently, motherboard makers must source those arguably crucial features from third-party suppliers to include them on Z370 motherboards. If you’re already mourning the loss of quad-core Intel chips for whatever reason, you might want to hold fire. It’s more likely that quad-core will find its way into even lower-powered processors over time, if not found within a Core i3 option yet to be uncovered. Simply put, Intel would be throwing away money if it neglected to find some application for quad-core processing. At any rate, all of this should be considered rumor (albeit from an outlet with a strong track record) until word is heard from Intel itself – or even more irrefutable leaks show themselves.